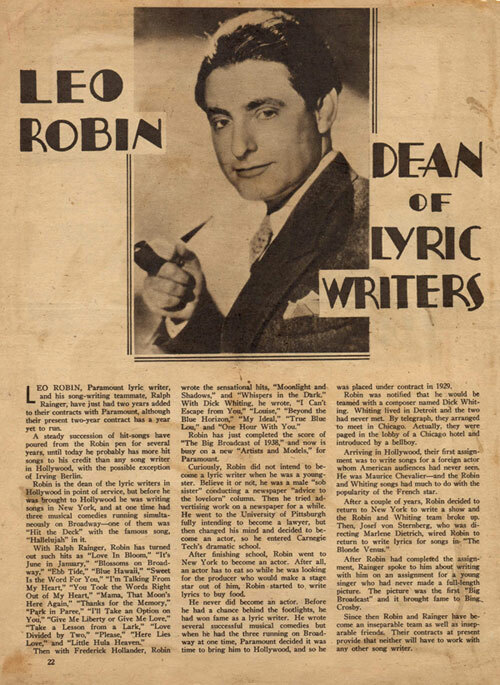 Early in his career, Leo Robin enjoyed a steady succession of hit songs, collaborating with Richard Whiting and later, Ralph Rainger. Robin and Rainger went on to become one of the greatest songwriting teams in Hollywood during the 1930’s and early 40’s. They wrote some of the best standards of the era and, in 1938, won the Academy Award for Best Song – “Thanks For The Memory.” Many of their songs from this period are included in The Great American Songbook. After Rainger’s tragic plane crash in 1942, Leo Robin worked with many other composers. Numerous standards were written in these collaborations as well and added to his collection of songs in The Great American Songbook. In 1949, he and Jule Styne wrote the score for the Broadway smash hit, Gentlemen Prefer Blondes, which included the iconic gem — “Diamonds Are a Girl’s Best Friend.” In 1972, only 2 years after it opened, Leo Robin was inducted into the Songwriters’ Hall of Fame. The Great American Songbook represents the classic and most enduring American songs from the 20th Century including works by such celebrated songwriters as Irving Berlin, Hoagy Carmichael, George Gershwin, Lorenz Hart, Jerome Kern, Johnny Mercer, Cole Porter, Richard Rodgers, Jule Styne, Harry Warren, and, of course, Leo Robin. He collaborated with many of the composers on this list, including Hoagy Carmichael, Jerome Kern, Jule Styne, Harry Warren and Richard Whiting. 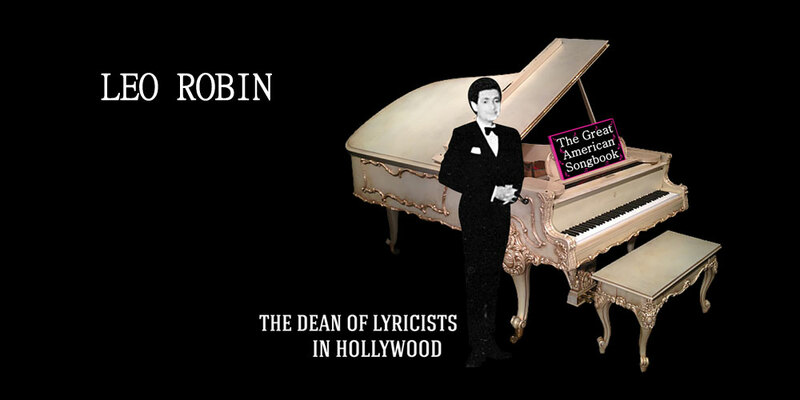 The Leo Robin Songbook, presented here, is a catalog of over five hundred songs that Leo Robin wrote for the Silver Screen and Broadway. The Songbook is organized alphabetically by song, followed by the work in which the song first appeared and, lastly, credits the co-writers who are identified with an “M” for having composed the music and a “W” for having co-written the words. To access this comprehensive list, click here: The Leo Robin Songbook. Visit the Studio if you would like to listen and sample selective songs from The Leo Robin Songbook. To access these samples, click here: “Zing-A-Zong Studio“.